Every once in a while a real jewelry masterpiece takes a turn on a red carpet. Just such an event occurred at the 2016 MET Gala. An epic diamond bird brooch made by Cartier in 1948 perched on Uma Thurman’s shoulder strap as she strolled up the MET’s red carpeted stairs. The big bird measuring almost 8-inches high and weighing approximately 5.5-ounces flew in just for the occasion from the Cartier Collection in Paris. A special commission piece, the design was created by the Cartier Paris workshop under the supervision of Creative Director Jeanne Toussaint. The platinum setting has almost 90-carats of diamonds covering the plumage. 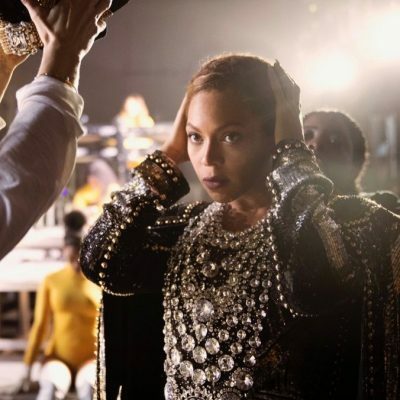 The largest gems—an emerald-cut diamond weighing 2.76-carats and two square shape diamonds weighing 2.35 and 1.29 carats—were provided by the client. Cartier sourced the rest of the 991 baguette, brilliant and fancy-cut diamonds. All the mixed gem shapes and the gentle S-form of the jewel give the piece movement and lots of attitude. 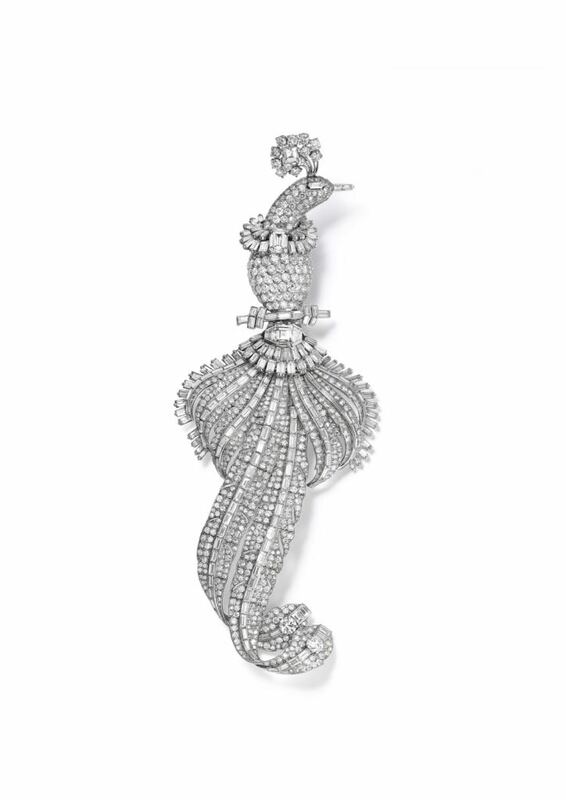 Birds entered into the Cartier menagerie of jeweled creatures starting around the 1920s. Mia Farrow wore an art deco Cartier Love Bird brooch in The Great Gatsby. One of the most well known Cartier birds is the colorful flamingo brooch made for the Duchess of Windsor in 1940. Over the wartime years the jeweled flock were symbols of freedom, national pride and natural beauty. The diamond bird brooch reflects the glorious return to glamour and the New Look styles of the post-war period. 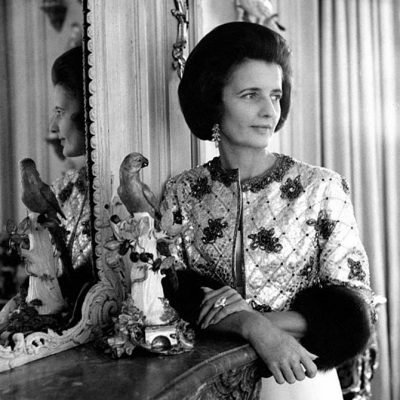 Almost as soon as the Bird brooch was completed it was featured in American Vogue on the bodice of a model’s black velvet Robert Piguet dress in a photograph by Francois Kollar with the caption “Mrs. Robert Lazard’s peacock.” Since 1948, there have only been a few sightings of the rare creature in books including Amazing Cartier and the exhibition catalogue Cartier in the 20th Century. 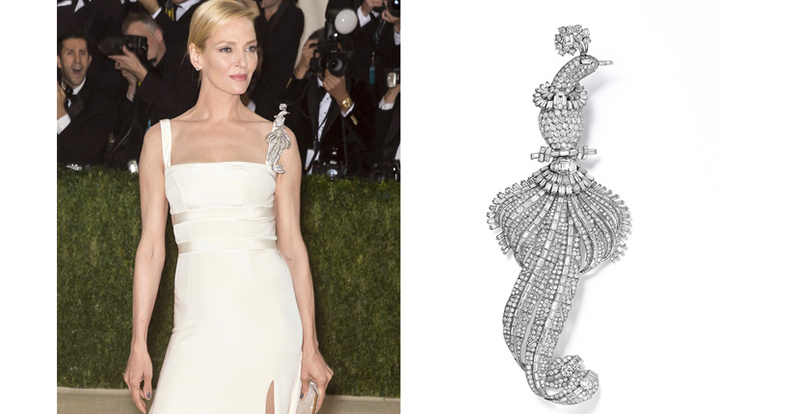 Uma Thurman gave the jewel its red carpet debut.